“Autumn” by John Collet, printed by Carington Bowles in 1779. From the collection of the Lewis Walpole Library. This week’s picture is an 18th-century depiction of autumn. It feels appropriate as we have been feeling the beginnings of fall. The temperature has cooled off and this week has been filled with absolutely beautiful weather, and I couldn’t be happier. I am so excited for fall and all it brings: the wonderful weather, the changing of the leaves, and of course, all the holidays that fall (pun not intentional) within this season. For some unknown reason, fall is perhaps my favorite season. Every year about this time, a comforting sense of nostalgia sets in as I remember fall as a child. Granted I grew up in Texas, so there was no changing of the leaves, but I vicariously enjoyed the changing of the season through movies, television, and photographs. Even though I didn’t live this particular aspect of fall, it is a prominent image in my memory and brings with it the anticipation of Halloween and Thanksgiving. Both are holidays I thoroughly enjoyed as a child, and still do to this very day. I loved deciding what I would be for Halloween and my elementary school had the best carnival. There was the soda ring toss, the cake walk, the haunted house, and other activities which I enjoyed while wearing that year’s costume. Once Halloween passed, it was only a matter of weeks until Thanksgiving. Each year my family and I visited my grandmother outside of Houston and my absolute favorite vegetables were served: green beans and mashed potatoes. And of course, there was the annual viewing of college football games between rival teams. In Texas, it was the University of Texas Longhorns versus the Texas A&M Aggies. Sadly, this will no longer be, as Texas A&M has switched athletic conferences. While things have changed since I was a child, as should be expected, I still experience a sense of innocence and peace when I think about the arrival of fall. Although it may not seem like it in today’s 90 degree heat, summer has come to an end. Labor Day has passed, the kids are back in school, and we’re already planning the Christmas decorating at Hammond-Harwood House. 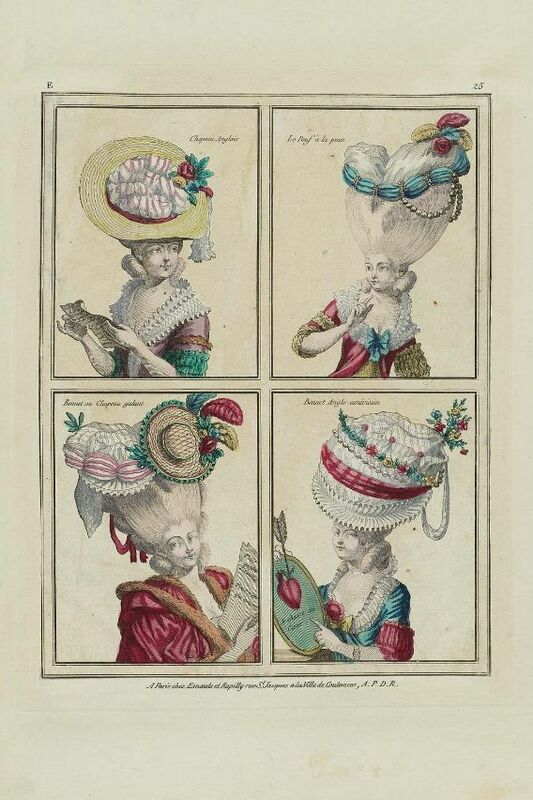 However, I think we should all honor the end of summer one last time by donning a fabulous hat like those in this French fashion print from 1778. I want the straw hat with the striped pouf on the upper left. Which one will you be sporting this weekend?